The English 4-hole ocarina is one of the simplest, cleverest musical instruments ever invented, and the Oc® is the simplest of them all. Pick up an Oc®, put the cord round your neck and see how many different tunes you can play. Eleven notes from just four holes will surprise you; the sound will charm you; and the price won’t break the bank! The Oc® is the ultimate portable musical instrument, and it is available in a range of six cheerful colours. So is the 4-hole Ocarina just a novelty? Where does it come from? It may surprise you to know that small round flutes with four finger-holes were made 2000 years ago in Latin America, their haunting sound echoing through the Andes. However, these ancient flutes could only play 5 notes. The modern Oc® is the result of extensive research and advanced manufacturing technology and plays up to 16 notes. Made in the United Kingdom, its sound fills classrooms and school halls throughout the UK, and around the world. The Oc® is made of impact resistant plastic in a single size to fit large hands as well as small. 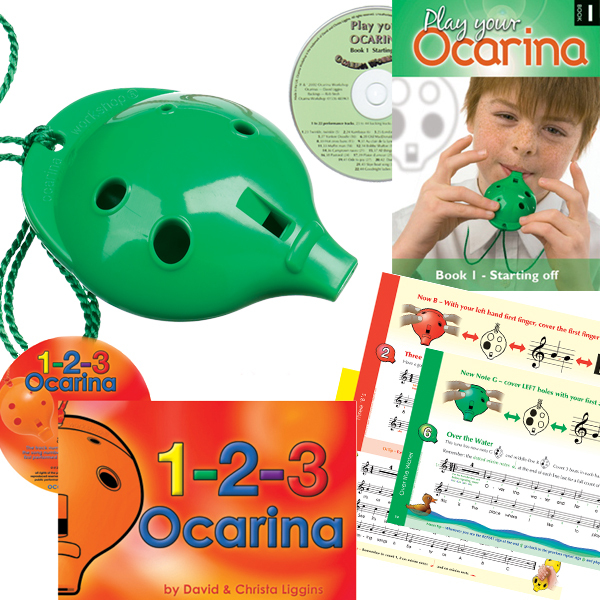 It is tuned to concert pitch so you can play along with Play your Ocarina music books and CDs, and with other musical instruments. Choose a 4-hole Oc to play with just two fingers of each hand, or a 6-hole Oc with its extra thumb holes if you’d like to try some of the trickier tunes in Books 3 and 4. Whichever Oc® you prefer, you’re guaranteed hours of tuneful fun! Listen to the Oc® on our ‘Sound‘ page or by following the links below. 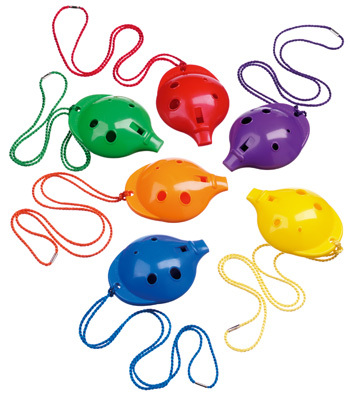 Thank you for the ocarinas. They are the best plastic ones that I’ve ever used, and they arrived within a week of ordering. The 6-hole Oc is a 4-hole Oc with the two thumb-holes added to give four extra notes. Get a 4-hole Oc® with each of Book 1 ‘Starting off’ and ‘1-2-3 Ocarina’ and you will soon be able to play over 50 tunes!